A windshield isn’t strictly necessary, but in cold or wet weather it’s a real comfort. 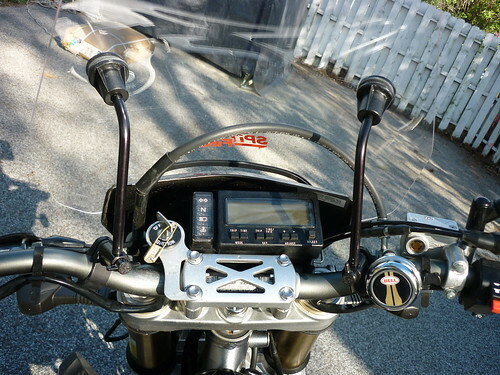 It’s also good on long highway trips – the wind forcing against your body for long time periods is very fatiguing, and on a super light bike with no protection like this one, you really feel like you’ll be swept off the back of the seat. 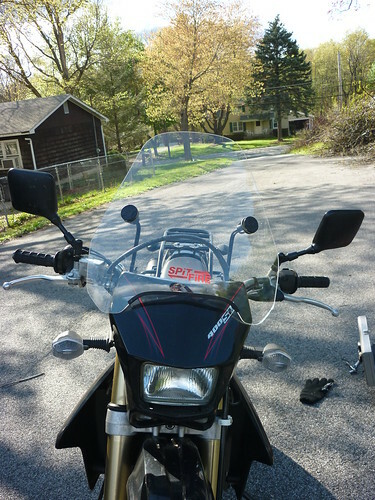 I got a great deal on a Spitfire windshield from a fellow forum member on TwoWheelFemales – it was a no brainer decision that I was thankful for. There are so many windshields out there, and I had spent hours and hours evaluating all of the different choices available. and it took quite a bit of adjustment to get it to sit exactly right. After trial and error I managed to position it so the brunt of the wind passed off of the windshield and hit me around the face. Too high and there was a terrible buffeting noise, too low and it didn’t serve any extra purpose than not having one. All that said, I didn’t locktite the adjustment screws and they have a really unfortunate habit of falling out while I’m on the road. I caught one of them three times before locktiting it in, but I didn’t do the other, and when it fell out (and I lost it) I pulled the windshield off for the rest of the summer of 2010. This windshield provided really excellent protection from the wind and provided a level of comfort and security that I was really surprised at. It was really hard to adjust to avoid helmet buffetting, though, probably because I am so tall and sit with such a regal posture at all times. I think some kind of laminar lip would have made a huge difference, but there’s only so many bells and whistles you can put onto a scrappy and utilitarian bike like this one, you know? Also speaking of bells and whistles, please note in the photo above my important safety apparatus: the bicycle bell. A gift from my little brother and his family!